Deiran Manning, a native Maine pianist, with notable awards including Stanza Prize in Composition, Premier prize in the Bradshaw & Buono International Piano Competition and the Ira Gershwin Award as winner of the Fiorello H. La Guardia Concerto Competition. Deiran has performed locally in recital at Oceanside Meadows, and Hammond Hall and at Merkin Concert Hall, Weill Recital Hall and Gracie Mansion in New York City as well as the National Concert Hall in Dublin. 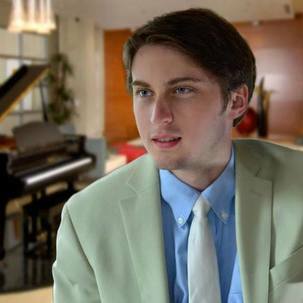 A former student of Edmund Battersby, Deiran currently studies with Edward Auer at the Jacobs School of Music, where he is pursuing a Masters degree in Piano performance with a vocal minor as a student of Wolfgang Brendel. He appeared with IU Opera Theater in the role of the professor in South Pacific and Ambrogio in The Barber of Seville. In addition he has sung the role of the Lord Chancellor with the University Gilbert and Sullivan Society as well as Papageno from Die Zauberflöte and Guglielmo from Cosi fan Tutte in the IU Opera workshop. He has performed as a member of the chorus in the Dell’Arte Opera in New York City and in IU Opera theater productions of Faust, Candide, La Boheme, Falstaff and HMS Pinafore. Deiran has been a member of the staff at the Winter Harbor Music Festival since 2009 and has accepted the Managing Directorship due to Peter Thoresen's increasing professional commitments which have made it impossible for him to join the festival.